All members of the museum and general public are invited to attend the Annual Laws Membership Meeting and Dinner to be held at the Bishop Elks Lodge on Saturday, February 16, 2019. The evening will begin at 5:30 with a short membership meeting. At 6:00 enjoy a special dinner catered by Kathryn Daniels. (Formerly of Classy Kay’s Catering.) The menu will include Chicken and crab served with béarnaise sauce, rice, vegetables, and dessert. Special meal, (vegetarian, vegan, etc. ), entrée is available by pre-order request with Kathryn Daniels at 760 920-3230 before February 9. The cost per dinner is $25. If you are currently not a member of the museum you are welcome to attend the dinner. Just come out to Laws before February 9 to pay for your dinner(s) and have your name placed on the guest list. At the dinner you may apply the cost of the dinner towards a membership with the museum. 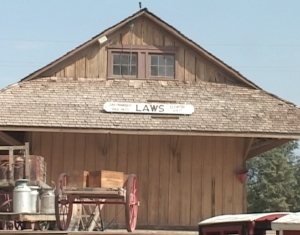 We would love to have you join us in our efforts to preserve Laws Railroad Museum and Historic Site!